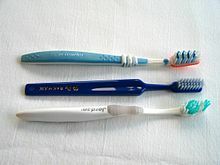 The teethbrush is an oral hygiene instrument uised tae clean the teeth, guims, an tongue. It conseests o a heid o tichtly clustered birses moontit on a haundle which facilitates the cleanin o haurd tae reach auries o the mooth. This page wis last eeditit on 5 Juin 2018, at 05:59.